Gov. 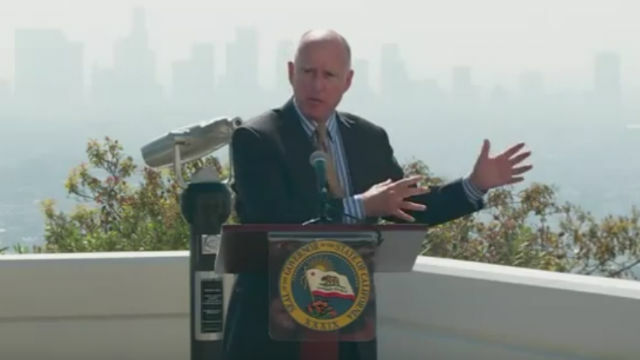 Jerry Brown, in Coronado for a two-day meeting with colleagues, called on President Barack Obama Tuesday to permanently ban new oil and gas drilling in the waters off California. The letter to the president was one of three environmental actions announced by the governor at the beginning of the Western Governors Association meeting at the Hotel del Coronado. Brown requested that Obama invoke his authority under the Outer Continental Shelf Lands Act to permanently remove federal waters off the coast of California from new oil and gas leasing, and guarantee that future oil and gas drilling in those waters are prohibited. Separately, the governor signed a memorandum of understanding with U.S. Secretary of the Interior Sally Jewell to coordinate the environmental review of potential renewable energy projects in the ocean, such as offshore wind and wave energy. The deal would also have state and federal officials identify offshore areas for potential projects and update permitting guidance for the projects. Brown also helped launch an international partnership aimed at protecting coastal communities and economies from the threat of rising ocean acidity. According to the governor’s office, oceans have become 30 percent more acidic since scientists began taking measurements, and the average acidity of the surface ocean is projected to double over pre-industrial levels by the end of this century. The ocean absorbs one-third of the carbon dioxide released into the atmosphere, harming sea creatures, marine fisheries and coral reefs. The states of Oregon and Washington, along with the governments of Chile and France, joined the partnership.